This week's new release: "Adrift," based on the true story of Tami Oldham, a young woman who sailed across the ocean with her boyfriend, ran into a devastating storm, and had to survive the elements for over a month. 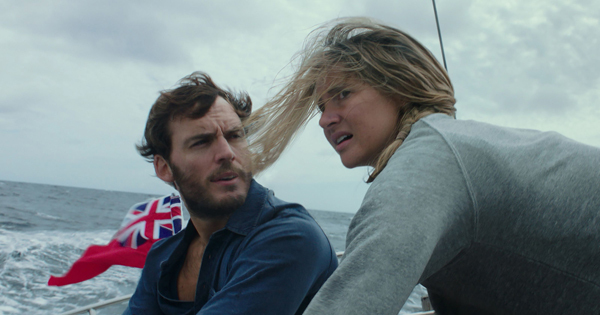 “Adrift” looks for all the world like a survival thriller, about a young woman named Tami Oldham (Shailene Woodley) and her boyfriend Richard Sharp (Sam Claflin) fighting the perilous elements to survive. But that’s not what the movie is about. The perils of starvation, deadly weather and a self-destructing ship only serve to highlight a very beautiful story about true love. That love is what keeps her going, even when death seems certain. Love springing from deadly circumstances is nothing new in Hollywood, but few films have ever done it better than John Huston’s “The African Queen.” This crackling adventure stars Katherine Hepburn and Humphrey Bogart (who won his only Oscar for this) as a missionary and an alcoholic sailor, respectively, who wind up stranded together on a rust bucket boat in the middle of war-torn Africa during World War I.
It’s been said that the best romances are the ones where, at the beginning of the story, you can’t imagine the heroes together, but at the end you cannot imagine them apart. 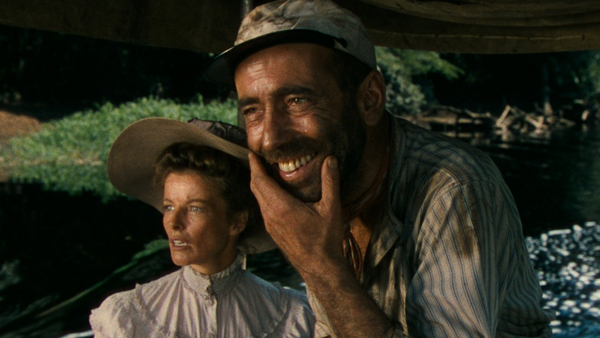 “The African Queen” may be an ur example: Hepburn’s stubborn puritan and Bogart’s laid back oaf couldn’t be less alike, but they bring out the best in each other. He knocks down her inhibitions and she inspires him to self-sacrifice. And like “Adrift,” it’s a movie in which the woman pretty much gets everything done. It’s Katherine Hepburn’s idea to turn their ship - the titular “African Queen” - into an explosive that can deal a deadly blow to the Germans. It’s her gumption that gets them out of one scrape after another. In “Adrift” there’s a very good reason why Richard Sharp isn’t particularly useful after the ship hits the fan(tastically enormous hurricane), but Tami’s accomplishments are no less impressive or inspiring. “The African Queen” is the kind of ripping adventure that “Adrift,” despite its marketing, never actually tries to be. But it basically set the template for this kind of naval romance. This four-star classic it would play beautifully off of Baltasar Kormákur’s three-star oceanic love story. If you've ever done any extensive travel, chances are you met someone like Tami Oldham in your journeys. Oldham, played by Shailene Woodley in Baltasar Kormákur's “Adrift,” was barely 20 when she had already committed herself to her naturally born wanderlust. She lived on the road and in boats, taking whatever jobs she could (which, in the film, appeared to be quite easy to land), and sleeping wherever she could lay down. Oldham hadn't seen her San Diego home in five years by the time we see her in “Adrift,” and she would have been pleased to stay away indefinitely. She made friends wherever she went, absorbing language and culture as she went. She was a citizen of the world. It's a life that is easy to covet. For anyone living alone in the bustle of the big city, there is likely a working fantasy – however distant – of dropping everything, selling all one's possessions, strapping on a backpack, and taking to the open road. The romance of solitude beckons, and life off the grid can feel impossibly faraway and tantalizingly possible. The promise of Henry David Thoreau's America can indeed be fulfilled. In no other film was that promise more romantically realized than in Sean Penn's excellent 2007 film “Into the Wild,” a peaceful and dreamlike film about literally burning one's money and finding a way to live with true independence. In “Into the Wild,” Emile Hirsch plays Christopher McCandless, a real-life well-to-do trust fund baby who had been to college, lived with money, had a family that loved him, and who, due to an ever-increasing disillusionment with the strictures of modern societal order and the limitations of capitalism, decided to abandon it all. Watching “Into the Wild” makes one feel free. We can truly feel the call of the open road, appreciating every small detail, every canyon, every trail, every friend, every river, and every bite of apple. “Into the Wild” also, wisely, doesn't let McCandless off the hook. His family resents his abandonment, and some even point out that his chosen life on the road could be seen as a way to avoid responsibility. Some city-dwellers simply don't understand McCandless' self-imposed exile. And, indeed, his life in the wild also ended up being his undoing. But for anyone with even a sliver of wanderlust, “Into the Wild” understands you.